Let’s face it. For most of us, getting that morning cuppa joe is a dire necessity; we simply can’t function without it! And not only do we want a great cup of java, we want it down our throats as quickly as possible too. But that’s where the problem creeps in. Most coffee makers seem to take one and a half lifetimes to brew a full carafe, and this agonizing wait sure isn’t the right way to set off any morning. So is there a faster solution out there? 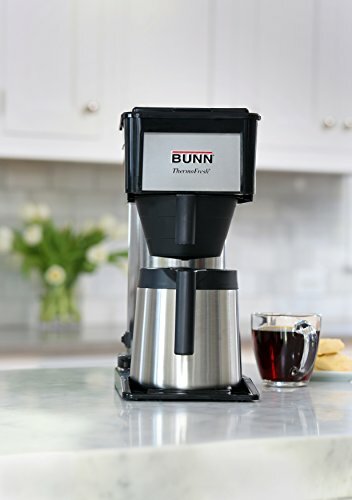 Well, the caffeine gods have heard your desperate, teary prayers and inspired Bunn to come up with the BUNN ﻿﻿BT Velocity Brew 10-Cup Thermal Carafe Home Coffee Brewer. And that 'Velocity’ in its name isn’t just an attempt to sound cool. 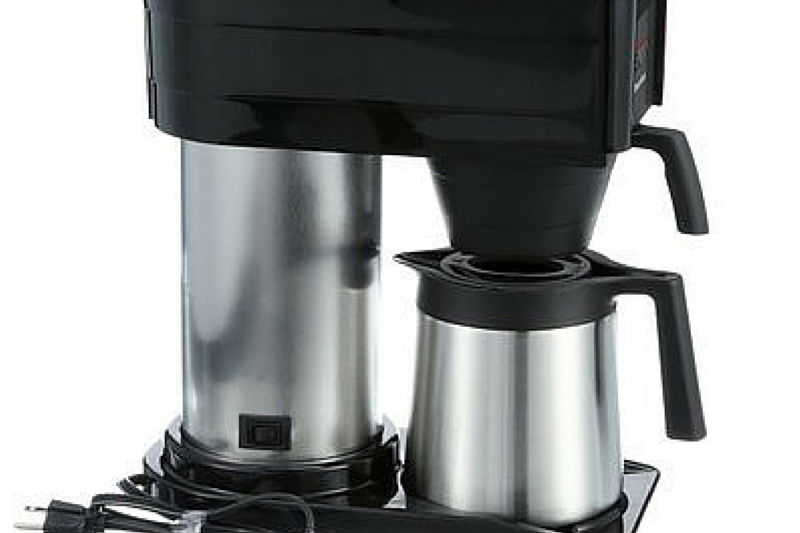 This $100 coffee maker manages to brew a FULL 10-cup carafe in under 3 minutes. That's right! An entire 50 ounces of joe in 180 seconds. Does it sound too good to be true? Well, let’s get on with this Bunn Velocity Brew review and find out if all this is just a mirage or a mesmerizing miracle. Okay, it has to be said, the BT isn’t the best looking machine out there; far from it. Especially considering that at $120, it isn’t what you’d call cheap. Its big, blocky shape is reminiscent of a dated coffee maker you’d find at one of those roadside cafes. And with a height of 15 inches and a depth of about 14, you’d better have quite a bit of counter-top space to spare. Yes, it does have some redeeming qualities. 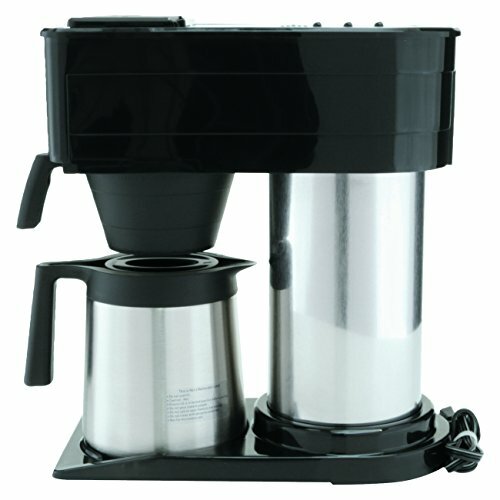 Like the massive 100oz stainless steel water tank and the similarly finished vacuum-insulated carafe. But the overwhelming plastic in the build takes away from the somewhat premium finishing you’d expect at this price point. There are also NO fancy LCD screens or sophisticated controls on this Bunn. All it has is just one on/off switch that sits at the base of the tank. So it’s pretty obvious, if you’re looking to get one of those coffee brewers so beautiful, you blush uncontrollably while loading grounds in it, then this isn’t it. But on the other hand, if you’re out for reliability, durability and unparalleled convenience, then you might have just met the machine of your dreams. Operating the BT velocity brewer is as simple as it gets; and this is one of the glowing highlights of this model. 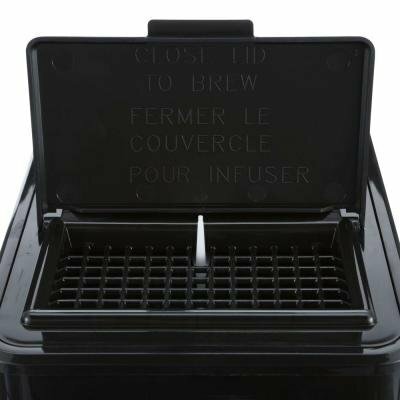 By now you must be wondering how it manages to brew a whole 10 cups in under 3 minutes. Well, it’s simple. The machine keeps the water in the tank constantly preheated at a temperature of about 200F. So it doesn’t have to go about the business of heating the water whenever you want that heavenly cup of coffee. If you’re a tea-lover as well or want to whip-up that morning oatmeal, the constantly heated water reservoir serves as an instant source of hot water. Yup, that's right! The BT is designed to always stay on. That's the key to its lightning-quick brewing time. So you’ve just unwrapped your shiny, albeit plastic-y, BT Velocity Brewer. What next? Well, you first need to fill up the water reservoir. And this is done by flipping open the plastic lid at the top of the machine and pouring water through the opening. You then plug-in the machine, turn on the 'vacation switch’ at the bottom, and wait for about 15 minutes as the 800-watt heater does it job. It only takes this long on the maiden-run though; granted it’s never turned off, that is. 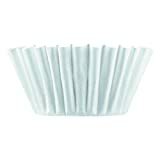 As the water gets all steamed-up, you ought to be prepping the filter basket. You’ll notice that this chamber is taller than most, so you just can’t use any standard paper filter. Way to throw a curve ball at us Bunn! But it all has to do with how the whole brewing process actually works. Water is sprayed at a higher-than-normal pressure, requiring the need for customized filters. But getting your hands on them shouldn’t be a problem. A medium to coarse grind works best for the BT. If it’s too fine it might lead to overflowing and a huge mess on your hands to clean up. 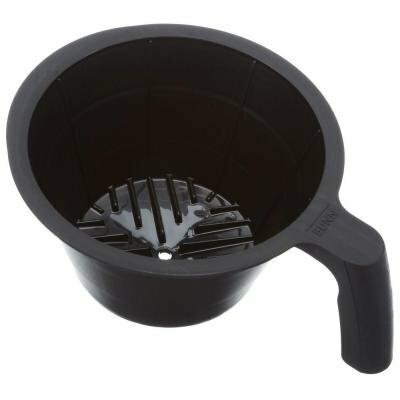 Once you’re done with loading the filter basket, all you have to do is shut the plastic lid- the one you opened to fill the water reservoir- and voila! The brewing process begins. No need to push any buttons. But remember to have the carafe in place before shutting the lid. Or else you’ll have piping-hot brew spraying all over the place, followed by a steady stream of warm tears. We can’t emphasize this enough; the BT Velocity Brewer is astonishingly snappy! Whipping-up a full carafe in less than 3 minutes is simply amazing. 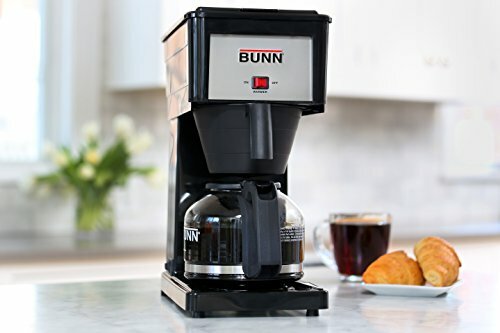 Compare that to most drip coffee makers out there that only manage a whole carafe in about 8 minutes; if at all they woke up on the right side of the counter-top that day. 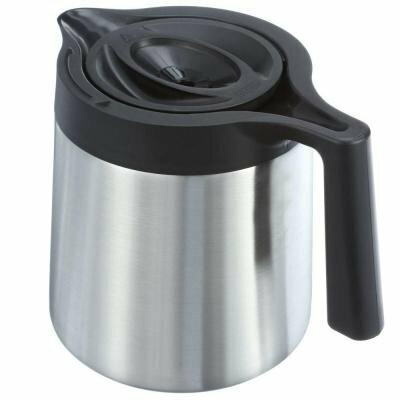 The particularly sturdy thermal carafe does a stellar job at keeping your java nice and hot for up to 4 hours. And since there is no warming plate on this model, you don’t have to worry about burnt-tasting coffee after a while. 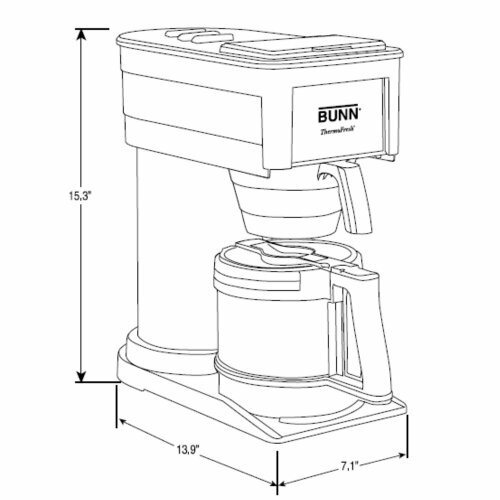 But if at all having a warming plate is one of you life’s callings, you can opt for the $100 Bunn GRB Velocity Brew Coffee Maker. 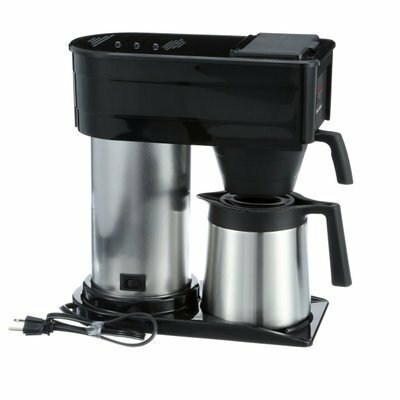 It has all the features of the BT, only that it comes with a glass carafe and warming plate instead of the vacuum-insulated pot. 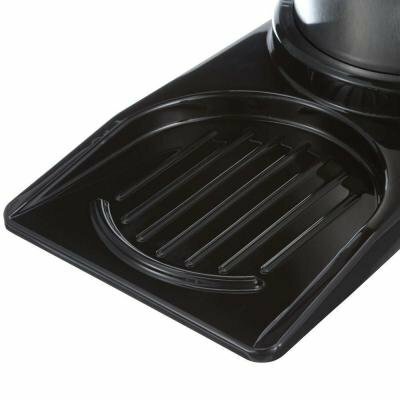 The porcelain-coated warming plate is controlled with a lighted on/off switch, which sadly doesn’t have an automatic shut-off feature. But if you really value quality, you’d better cough up the extra $30 and just get the thermal carafe. Your taste buds will thank you. Pretty amazing! For a machine that works this fast, you’d be inclined to presume that it trades quality for convenience. But that definitely isn’t the case. Since the BT showers the grounds with water at the perfect temperature, it yields a cup of coffee that is smooth, rich, and an absolute pleasure to drink. And thanks to the pretty impressive thermal carafe, the first cup is almost always as good as the last. Thermal carafe works like a dream. Needs special filters to operate. Isn't ideal for finely ground coffee. Carafe might be a bit tricky to clean. Needs to constantly stay on. In a market crowded with tons of products, it takes a lot to stand out. But Bunn has done this brilliantly. 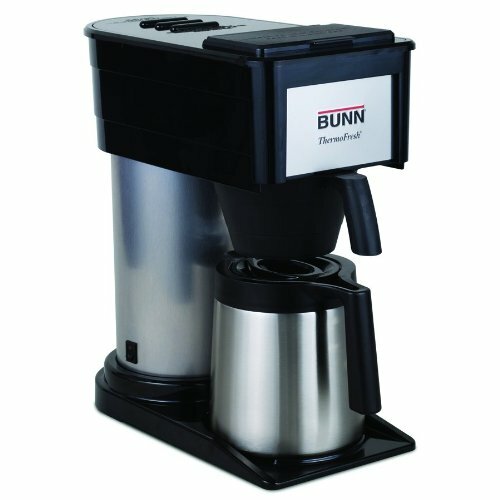 The BT Velocity 10-cup Thermal Carafe Home Coffee Maker is one of the most convenient machines money can buy. Not saying that it's perfect. It definitely isn't a looker, takes quite a bit of space, and can be a pain to clean. But if you can look past the lack of fancy controls and beautiful lines, you’ll inevitably fall in love with its ground-breaking functionality. You now have the ability to go from zero to delicious in under 3 minutes. Well done Bunn.